YellowAirplane.com: F-15 Strike Eagle Jet Fighter Aviation Art, Prints, Posters and Gifts. F-15 Eagle Jet Fighter Aviation Art, Prints, Posters and Gifts. 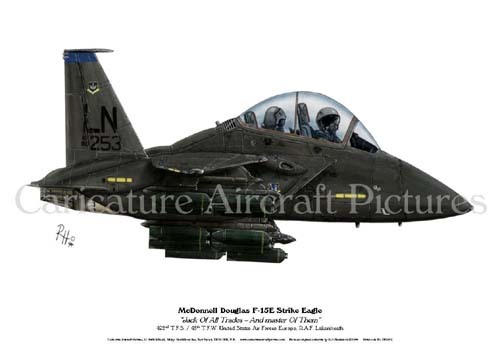 McDonnell Douglas F-15 Eagle jet fighter Aviation Art, Posters, Pictures, Prints, Clocks and Lots of F-15 Strike Eagle Gifts. The F-15 Eagle was manufactured by McDonnell Douglas, weighs 31,700 lbs empty with a max weight of 81,000 lbs, is 63' 9" in length with a wingspan of 74' 9", it has a maximum speed of 1650 mph a cruise speed of 570 mph and a max climb of 50,000 ft/min. The F-15 Eagle has two Pratt & Whitney F100 engines which produce 14370 lbs of thrust with 23,450 lbs with afterburners and a total of 46,900 lbs total thrust. These aircraft models provide a great source for entertainment and education. These jet fighter aircraft models come in plastic model kits, wood kits, die cast and mahogany aircraft models. An Israeli Military Air Force F-15 Eagle is in hot pursuit of a Syrian Military Air Force MiG-23 in June 1982, when the skies over southern Lebanon saw the most massive dogfights since the end of World War II. The IAF claimed 85 aerial victories and lost only three aircraft - all to ground fire - during its Operation Peace for Galilee. 30"x 21" limited edition print is signed and numbered by the artist. The Military F-15 Eagle flown by Lt. Col. Tim Duffy of the 102nd Fighter Wing, Massachusetts Air National Guard, makes its initial reconnaissance pass over the South Tower of the World Trade Center on September 11, 2001. 35"x 25" limited edition, numbered print is signed by the artist, by Duffy, and by wingman Maj. Dan Nash. This collection, featuring 946 hi-resolution photographs - many never-before-published - allows you to view and print pictures of the F-15 Eagle and the F-15E Strike Eagle. Suitable for printing photos up to 8"x 10", calendars, posters and more, the image libraries also include thumbnail index pages for easy searching; PC and Mac compatible. 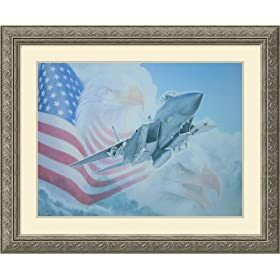 Frame: Pewter Fleur-de-Lis and Vine - 2.5"
A fully-armed F-15 Eagle thunders through the flag draped clouds on this 20"x 16" poster. Magnificent! An F-5 aggressor takes on an F-15 at the U.S. Air Force's prestigious Fighter Weapons School to see who will be "Top Gun" today. Measuring 30"x 20" when assembled, this puzzle's 1000 pieces are all cut to the same shape for added challenge and enjoyment. Includes puzzle preserver and instructions for making your puzzle a permanent picture. Aviation Art Prints measure approx.12"x16.5"(297mm x 420mm) and are printed on 240gsm card. WANT YOUR SQUADRON'S AIRCRAFT TRANSFORMED INTO A CARICATURE PRINT? No matter what you fly, a caricature print can be made of your aircraft! There is a one-off charge for the production of each new caricature profile created, and discount s are available for bulk orders of prints (minimum print order quantity applies) We also have all kinds of aircraft prints already made at a very low . Here to find out More. 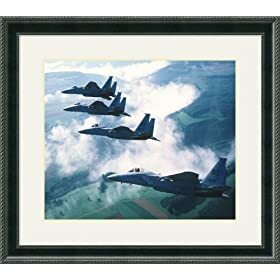 Frame: Black Raised Rope - 2.5"
America's Air Force Celebrates 100 Years of Aviation. Hildebrandt. Assembled by the USAF to celebrate the 100th anniversary of powered flight, this unique demonstration team pairs military pilots in the latest aircraft with civilian pilots in classic Warbirds for breathtaking formation flight. Outstanding air-to-air photography captures F-16 Falcons, F-15 Eagles and A-10 Warthogs in concert with a C-130, B-25, F-86 and others. 178 pgs., 185 color photos, 12"x 9? ", hdbd. A bald eagle looks on as its powerful F-15 namesake streaks across the front of this shirt. This striking 100% cotton, pre-shrunk, black t-shirt features a gorgeous image screen-printed for stunning color and durability. This beautiful pocket knife features an embossed F-15 Eagle beautifully detailed in nickel silver. Includes a knife blade, scissors and nail file all tucked into an attractive gold-tone case. This handy accessory is as sharp looking as it is sharp!